And last but not least come the Hanging Gardens of Babylon! Of course, one of the largest and most important cities in the Ancient world had to be home to a great Wonder. The only thing is, it’s not sure these gardens ever existed. No archaeological evidence has been found, and the whole structure and irrigation systems would have required a great technical development. Anyway, this Wonder of the Ancient World has g0ne down in history as one of the most fascinating of the seven. The gardens were built by King Nebuchadnezzar II around 600 B.C. in order to please his homesick wife. He brought a wide selection of plants from Media, homeland of Queen Amytis and built a series of terraced gardens next to the Palace on the shores of the Euphrates. There was a large water deposit on the top which poured water into the many little canals throughout the gardens. Stone slabs were set in place to prevent the ground from eroding, since the gardens needed around 35.000 litres of water per day! The beauty of the gardens was only visible to the rest of the city from the other shore of the Euphrates, since only Royal guests could enter. There are no original texts with descriptions on the Gardens, and only later references reveal some information. This has lead to many theories about the construction and actual structure of the Gardens of Babylon, some even say the Gardens were built in Nineveh by the Assyrian king Sennacherib. The gardens splendour followed the same decadent path of the Babylon Empire. When Alexander the Great reached the city in the fourth century B.C. the Gardens were partially destroyed and completely abandoned. They were finally destroyed by a series of earthquakes in the second Century B.C. 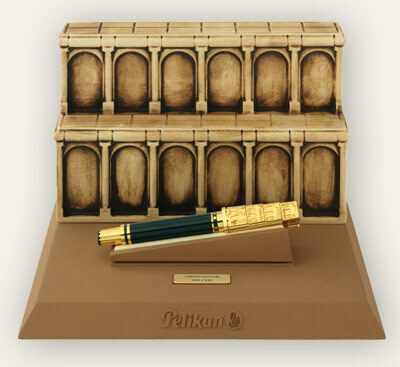 In 2009 Pelikan created the fifth edition of its “Seven Wonders of the World” collection dedicated to the Hanging Gardens of Babylon. 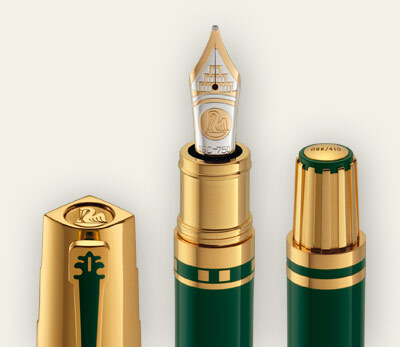 The pen is finished in fine green lacquer to resemble the freshness and natural beauty of the Gardens. The gold plated cap is decorated by a representation on relief of the Garden’s terraces. This beautiful pen is made with a nice and functional design since both qualities were of key importance for the Ancient Wonder. For more detail, the nib has a bicolor engraved image of the Gardens! The clip is decorated with green lacquer in the form of a plant or tree, and the presentation box is a miniature model of arcs, columns and terraces. And that’s all folks! The Hanging Gardens of Babylon pen is still available at Iguana Sell and is probably one of the last pens available for this series!I hope you’ve enjoyed our Pelikan Wonders of the World reviews. If you’ve missed any you can find it in our blog! I hope you’ve enjoyed our Pelikan Wonders of the World reviews. If you’ve missed any you can find it in our blog! There are still two wonders of the World left: The Statue of Zeus at Olympia and the Mausoleum at Halicarnassus. We hope Pelikan pens finish this beautiful collection of limited edition pens and delight us with the two pens left to go!